If you have missing teeth, you probably know that a dental implant is an amazing option for tooth replacement. The thing that you need to focus on after receiving them is implant maintenance, so that you ultimately protect your smile’s investment in the long run. 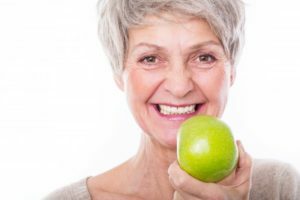 Learn all about dental implant care and how to help them last for a lifetime in this week’s blog post! Dental Implants are Great Because They Are Just Like Natural Teeth! When you speak to your dentist about replacement options, you’ll learn that implants act as natural teeth by replacing two critical parts that go missing: the root and the crown of the tooth. Thankfully, dental implants work to replace both of the missing tooth’s components by installing a titanium implant as the root and aesthetically pleasing prosthetic as your replacement dental crown. They work so well because your body is able to treat your tooth replacement as a natural part of your smile—plus they are biocompatible! Keeping up good oral hygiene by brushing and flossing your teeth as normal—even if they are all replacement teeth. Maintain a balanced diet because it directly affects the mouth and strength of your anchoring jaw bone. Use the correct dental tools like a soft toothbrush to avoid damaging your dental work. If you have remaining teeth, continue to show them the appropriate dental care as well. Avoid or quit any tobacco use as the substance will damage the stability of the surrounding bone that holds your dental implant in place. It’s true that dental implants have an extremely high success rate, but that’s because patients trust their dentist to help them along their tooth replacement journey. Your dentist will help you keep your new smile strong, stable, and beautiful by completing dental checkups and exams as well as professional deep cleanings. Each time you visit your local office for an appointment, your dentist will have the opportunity to check on your restorative dental care. If you haven’t already, it’s time to find a dental practice you can call home. This way, implant maintenance and smile care are only a phone call away! Here at Lapalco Family Dental, we know how important it is to replace missing teeth—no matter how long they have been gone. You can avoid hardships in the future and other dental concerns by addressing your missing teeth problem from the beginning. Then, you’ll just need to pay attention to caring for your new smile! Learn more about helpful tips and tricks on how to care for dental implants from the dental expert himself. Contact us today.